Hot chocolate flows endlessly in NYC's winter. Trek into the bracing weather to imbibe creamy warmth from one hot chocolate festival to another. Our foray into our neighborhood François Payard Patisserie following a morning yoga class brought a rich and fortifying first course to our breakfast. 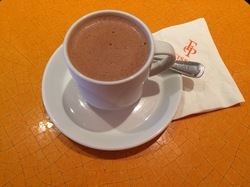 Payard's tantalizing offering during Valhrona Chocolate's January Festival was a flavored raspberry and orange blossom hot chocolate (recipe). We sipped its sweet heat while trying to avoid the other temptations of the orange décor display cases laden with chocolates, pastries and gelatos. Valhrona Chocolate, located in Brooklyn, hosted the city wide hot chocolate fest along with several partners. Thirteen vendors located at forty four addresses throughout Manhattan, Brooklyn and Queens poured variations on a theme. And to help salve any guilt you might have felt about indulging yourself, fifty cents of the cost of each hot chocolate was donated to City Harvest's over thirty years of food rescue to feed nearly 1.4 million New Yorkers. To celebrate the month of February, City Bakery has poured a hot chocolate festival for more than 20 years. That amounts to more than 50,000 cups of hot chocolate according to their blog. City Bakery posts a menu of the daily flavor at the beginning of the month so you are able to plan your visits. These include a taste for every palate, such as: milk or dark chocolate; some spiked with espresso, cinnamon, ginger, lemon, banana, salted caramel, bourbon, or peanut butter; or, sourced from countries of origin like Peru or Ecuador. Top each day's special with CB's homemade marshmallows. As we took over a table from the previous chocolate imbibers, they warned us off the stout flavored Super Bowl Sunday hot chocolate option. A beer and chocolate combo would not generally be our thing anyway. So we aimed for the regular dark chocolate, which, with its cream base was not so regular and quite delicious. We have been lucky to have sampled distinctive hot chocolates in many countries: the heavily spiced of Mexico, the thickened pudding of Spain, the cream infused of France and the distinctive bicerin recipe of Turin, Italy, with its layer of chocolate, coffee and cream. Winter 2016's storms demand their due. 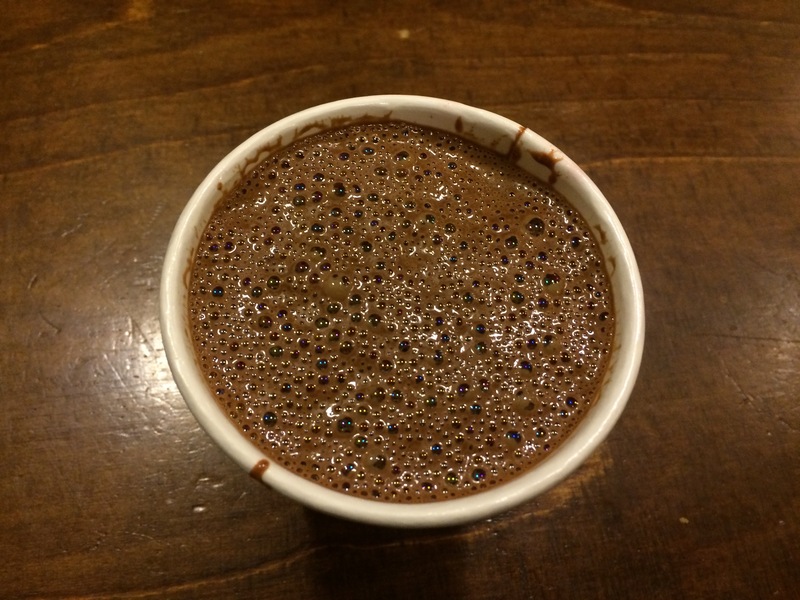 Thank goodness New York's hot chocolate trail is only walking distance away. If only there were more calories to spare. Deborah R. Prinz lectures about chocolate and religions around the world. Her book, On the Chocolate Trail: A Delicious Adventure Connecting Jews, Religions, History, Travel, Rituals and Recipes to the Magic of Cacao (Jewish Lights) is in its third printing. The book is used in adult study, classroom settings, book clubs and chocolate tastings. Prinz blogs at The Forward, On the Chocolate Trail, and elsewhere.